The sanitary problems of the township were definitely rural ones. For example, around 1907, Medical Officer of Health Dr. Opie Sisley complained of ducks, geese, and pigs near wells, and well covers “so loose and ill-fitting as to allow entrance to toads, frogs and all sorts of animal matter.” The medical officer of health focused mainly on the prevention and monitoring of communicable diseases. For example, he closed schools during the 1918 flu epidemic. The board also occasionally hired doctors and nurses or paid hospital bills when families could not afford them. Medical Officer of Health Dr. E.N. Coutts wrote in his annual reports of the need for medical examinations of school children. 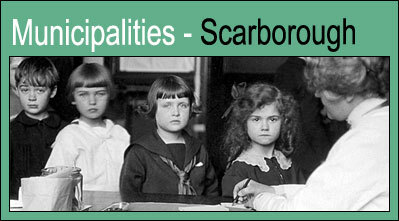 He recommended the township hire a public health nurse to examine and teach children about health: “I believe her work would result in an improved tone in the hygenic [sic] and moral condition of the township.” By 1923, Scarborough had hired a public health nurse. By the 1920s, the villages in the township were growing. The Board of Health began to receive more complaints stemming from this urban growth: smelly manure piles on farms too close to homes, factory effluent polluting streams, and garbage dumps (including some run by the City of Toronto) that created a nuisance. Part-time Medical Officer of Health Dr. C.D. Farquharson ordered that wells and privies be closed, and that people connect to the township’s utilities, wherever they existed. In 1947, as the post-war suburban boom started, Dr. Farquharson was appointed Scarborough’s first full-time medical officer of health. By the 1950s, Scarborough had a full public health program.